I have requirement for form personalization form on sales order form. When Ship_to field is changed and while saving (Message should say if the SHIP_TO is changed the freight_terms, FOB and ...will be changed) . I am able to get the above message when i change any field in sales order form. but i wanted this message to display only when i change the ship_to field in sales order form. Please guide me how to do this using form personaliztion. To do this you can compare the existing value of SHIP_TO field and the changed value. I would say you create a variable in FP and store the existing value of SHIP_TO location. If any one moves out of SHIP_TO field you write the condition to validate the current value and the variable value, If those are not same show the message. in attachment screen there is only FND tables .so how i match both in same personalization. really sorry for my English.. Yes attachments are saved in fnd_attached_documents. If query the table you can find reference to the module and particular record. fnd_attached_documents.entity_name refers to the module / form where its originated. fnd_attached_documents.pk1_value represent the primary key of the record. If you have attached and attachment in Purchasing form then you have fnd_attached_documents.pk1_value ~ po_header_all.po_header_id. Hope with that you can form the query and build the condition for your forms personalization. Hi i have requirement for form personalization for Modifier form in Pricing. I want to disable all field in Modifier form (if end date < today). i don't want change everything if end date < today. Here is how you should do that. You may need to do the same thing on different events so that it gets disabaled in all cases and have to enable it back when you move to a record which is eligible to be updated. Thanks for the advice. But i have doubt. 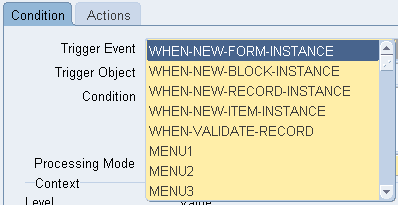 Why MODIFIER_LIST not use WHEN-NEW-BLOCK-INSTANCE same MODIFIERS I also modify header information on the Form. Well you can use that too, it depends on your requirement... I was under impression that you want to disable update on modifier lines which are end dated. If you have requirement that if a modifier at header level is end datet and you don't want to allow update, then please use the block as MODIFIER_LIST. How can we suppress the frm 41050 warning messages through form personalization? Can you please tell the steps/scenario where you get the FRM-41050 message. Based on that we can get some thing. I have done form personalization to make sales order lines read-only after saving changes on a custom sales order form. Functionality is working fine, but for every line this FRM message is poping up. SO want to suppress these messages. I am not able to reproduce it... I tried with setting update/insert allowed to FALSE but didn't get such warning message. I only see few HINT message on bottom left screen. If you have block and even that you setup the FP.. I can try and provide some fix. Sure I would try to help but need to understand at what time and scenario you get this message. Based on that I will and suggest some thing.. a screenshot would be better to understand. Hi Tauseef! Thank you! In Inventory, Transactions->SubInventory transfers form. When user enters transfer 'items' more tha we have in the stock at the moment, he/she will get message is´App-INV-05407 'quantity will drive inventory negative' . We allow negative inventory in factory organizations . So, this is just standard warning message, that we want to suppress for specific responsibility(Context). But the action, I am stucked here .. How to supress the message or how do I silently 'say' OK on that message and proceed. But the problem I see that the condition is not getting satisfied.. Since FP is all event based and while the pop up message is showed no event is generated. Thank you for the detailed explanation. Was extremely helpful for me. Keep up the good work! Hello. I have an issue with the Material Requirements form for Depot Repair Responsibility. Under supply tab i need to make the Subinv field mandatory and it did turn yellow but it allows me to save even if no data are inserted. Can you please help me on this? Thanking you in advance. Hi I have requirement for form personalization for updating recieved_date of rma collection plan if receipts form in receiving(Purchasing Resonpsibility) has the the same data.Please help. 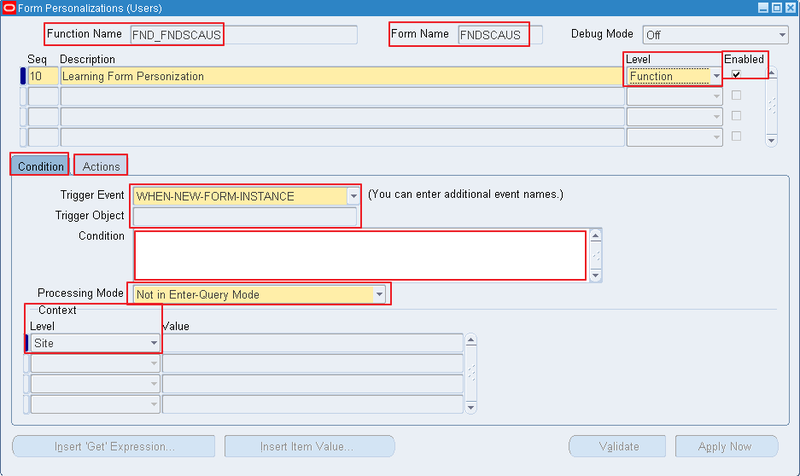 how to check the field in form is getting auto-populated or not?? ?